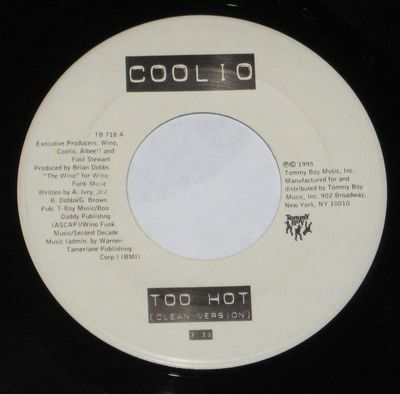 Powered by eCommercePlayer.com Powered by eCommercePlayer.com one 7" 45RPM Record of Coolio on the Tommy Boy label, #TB718. Songs: "Too Hot (Clean Version" & "Gangsta'a Paradise (Featuring L.V.)" Labels are Excellent. Vinyl Grade: VG+. Shipping is $3.00 for Media Mail within the United States, insurance is your option. I will ship internationally only if payment is made through Pay Pal. International buyers should contact me for shipping rates. I accept pay pal. Payment is due within 10 days of purchase. Thank you. Cumbia 45 LOS TREMENDOS VAGOS La Muerte Y El Diablo Superior HEAR Killer! Cumbia 45 JUAN MORALES ESQUIVEL La Pelirroja/Tu Sabor HEAR Impacto Nice! Cumbia 45 CONRADO PEREZ Por La Cruz/Dime Si Me Quieres C.P. Generator HEAR Rare! Cumbia 45 ANICETO MOLINA Mi Cumbia Colombiana/A Punta De Copa HEAR Killer!